Complete a campaign at least twice a month for the next six months. 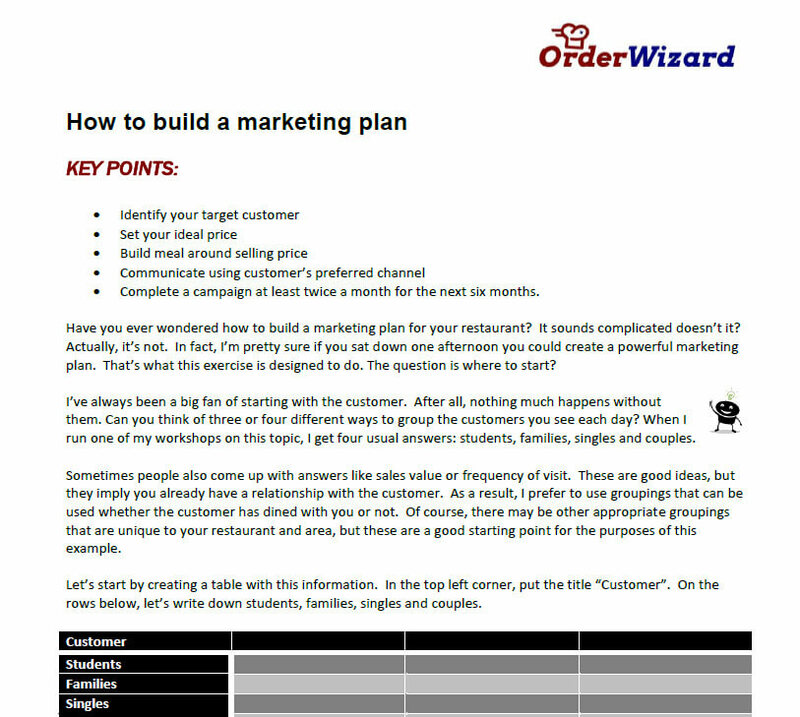 Have you ever wondered how to build a marketing plan for your restaurant? It sounds complicated doesn’t it? Actually, it’s not. In fact, I’m pretty sure if you sat down one afternoon you could create a powerful marketing plan. That’s what this exercise is designed to do. The question is where to start? I’ve always been a big fan of starting with the customer. After all, nothing much happens without them. Can you think of three or four different ways to group the customers you see each day? When I run one of my workshops on this topic, I get four usual answers: students, families, singles and couples. Sometimes people also come up with answers like sales value or frequency of visit. These are good ideas, but they imply you already have a relationship with the customer. As a result, I prefer to use groupings that can be used whether the customer has dined with you or not. Of course, there may be other appropriate groupings that are unique to your restaurant and area, but these are a good starting point for the purposes of this example. Let’s start by creating a table with this information. In the top left corner, put the title “Customer”. On the rows below, let’s write down students, families, singles and couples. Now if you are creating a meal deal for a family, this amount will be much higher. Perhaps something like £29.99 would work well. The exact figure will vary depending on your area and your competition. The key point however, is that you put some thought into this. As you decide on the target prices for each of the four customer groups write them down in the column immediately to the right of your customer list.From here, I like to think about the best possible price for this promotion. From the customer’s perspective, free is fantastic, but this doesn’t do much to help your profits. The trick is to think about a target price. If you want to create a really attractive student meal, what’s the most you can charge before you start to lose potential customers? To keep the math easy, let’s say £5.99. The next step is one of the most important. You must now decide what food items to include in your special meal. This is determined by two factors. First, your direct food costs should be one third of your total sell price. For example, if your student meal will sell for £5.99, your food cost should be no more than £2.00. 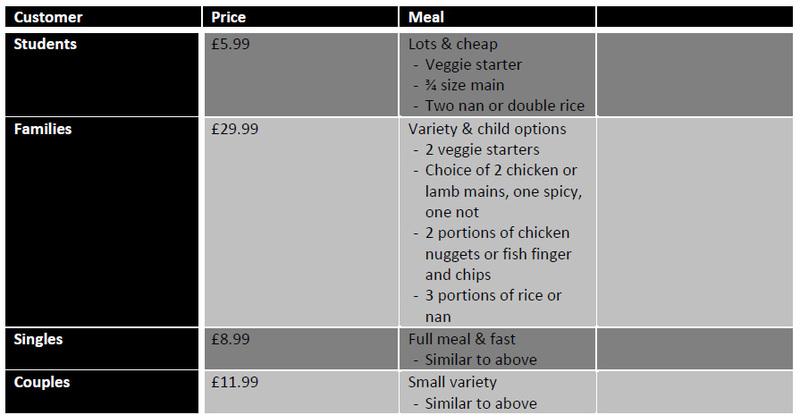 A £29.99 family meal should contain £10.00 or less of food. If you do not maintain this margin, you will start to find it very difficult to cover the other fixed costs that all restaurants face. Second, think about the customer need you are trying to fill. Students are great. They want lots of food and they want it cheap. A £5.99 sell price definitely achieves the low cost criteria, so now you just need to figure out a way to put lots of low cost items in the bag. Some obvious candidates would include an extra piece of Nan bread or a double portion of rice. Equally, you may consider using vegetarian dishes instead of meat based options. This will eliminate expensive ingredients such as chicken, lamb or pork. The same idea applies to families. Here are two ideas from my workshops. First, make sure to solve the problem of the adults having to cook. Most people dine out because they don’t want to cook. If mum orders in a takeaway meal, and then still has to make something for the kids, she probably won’t order at all. This applies to booking a table too. As a result, make sure to include things like chicken nuggets/fish fingers and chips as options in the family meal. The second thing is to include a small selection from which to choose. It’s not easy to get everyone to agree on a spicy chicken dish, so make it easy by offering a spicy and non-spicy version of chicken and lamb. Once you have created the meals for each type of customer, add a column heading called “Meals” and add the information in the appropriate position. Here is an example of one I did. Now that you have a great selection of promotions, you need to tell the world about it. After all, if they don’t know it exists, they aren’t going to buy it! Carrying on with our examples, what would be the best way to communicate with students? If they happen to be members of your Gold Club, email or sms would be high on the list. To attract new students, you could also put up posters at a nearby university. Most universities allow you to do this for a very low cost. For families in your Gold Club, an email campaign and notification in their online user account pages are good places to start. You may however, need to be a little more creative if you want to attract new families. Over the years, restaurants have got into the habit of indiscriminately dropping a menu through the letterbox of anyone in the area. To no one’s surprise, this isn’t economically viable anymore. The leaflet needs to be your silent salesperson. And every good salesperson will tell you that you sell one thing at a time. I have seen response rates, and therefore the profitability of a campaign, increase dramatically by using a highly targeted offer on a postcard to a clearly defined area – such as a family neighbourhood. And here is the good news. If I said you have just completed 90% of your first marketing plan, would you believe me? Actually, you have. If you pick up any Marketing 101 textbook, you are going to come across something called the 5 P’s. The 5 P’s is short for People, Price, Product, Promotion and Place. These are the foundations stones of a marketing programme. Curiously, the column headings in your table could be replaced by these headings too. In my example, I removed “Place” simply because this is going to be your restaurant, which is pretty obvious. For completeness however, I’ve added in below. Now it’s time to pull it all together. A marketing plan is a way for you to share the unique benefits of your restaurant with its various customers in a way that suits their lifestyle. 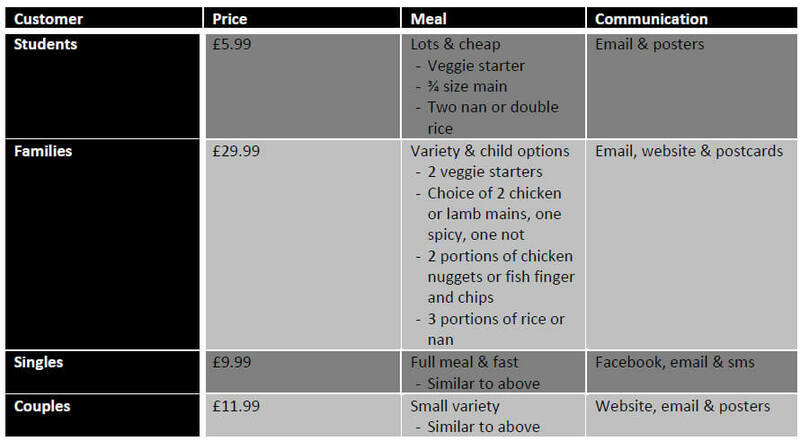 So, the first step in this example is to tell students about a great new meal that has loads of food for only £5.99. You are going to do it by sending them an email and putting up posters on the first day of the next calendar month. Excellent! But it gets better. On the fifteenth of the month, you are going to deliver a door drop of a single offer postcard to a small family estate that is two hundred meters from your restaurant. At the start of next month you are going to…. Depending on the table you develop, your marketing action plan could look like this. You get the idea, so now it’s your turn. Step 1 – Let’s start by creating a blank table on your piece of paper. Then complete the Customer column. It should look like the example below. 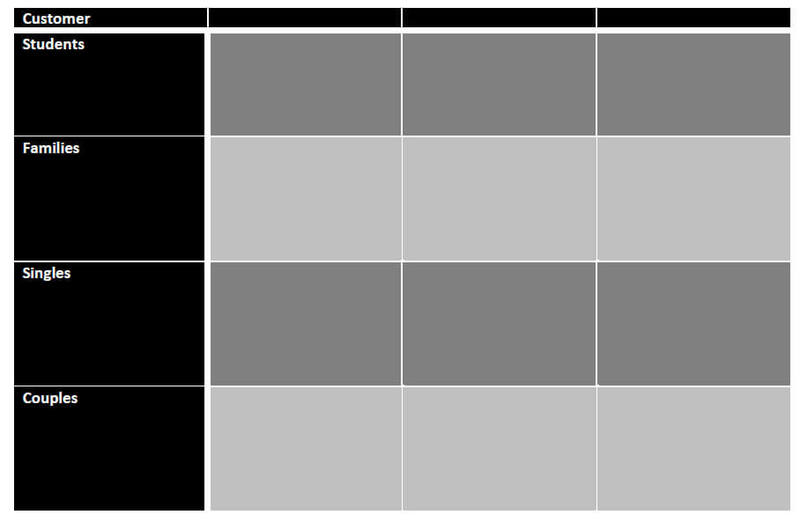 Step 2 – Complete the rest of the table using the same process I described earlier. Step 3 – Choose which customer group and campaigns you want to do first. You may choose to go in a cycle (i.e. families, student, couples, singles, families, student, couples, singles). The order doesn’t matter. The key is to write it down. Step 5 – Pick your launch dates. To get going, you may want to run a promotion every month. As you get more experience, I suggest increasing the frequency to once every two weeks and then one per week. It gets easier with practice. That’s it. Congratulations on creating your first marketing plan! PS: Don’t forget to do it! Don’t have time. Let Order Wizard do the marketing for you!